There’s a book I have that I love. It’s called Country Wisdom & Know-How. The tag line is “Everything you need to know to live off the land.” It’s brilliant. Everything about the book screams utility. Its trim size is 13.5 by 10.5 inches, that is to say, this thing will NEVER rest on a bookshelf. Even then, it’s close to 500 pages of micro-tiny print. I honestly feel that if civilization collapses tomorrow, I will be all set to head out and homestead with this book. 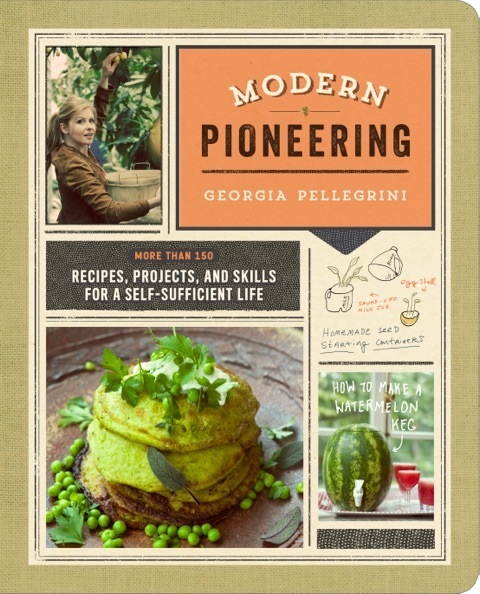 Given my appreciation of this masterwork of self-sufficient living, you might assume that I would simply love a book called Modern Pioneering: More Than 150 Recipes, Projects, and Skills for a Self-Sufficient Life. And you would be right, but for the wrong reasons. This book is not a guide to modern pioneering. It’s more like a Martha Stewart version of “pioneering.” It’s self-sufficiency as a DIY aesthetic rather than an approach to life. That’s not all bad, actually. There’s not much in here that I didn’t find interesting. Want to know how to make dandelion wine? This is your book. Want to gather wild herbs and make mint chocolate shakes for your BFFs? Again, I will direct you tither. There’s even helpful directions for building a lean-to, and a couple pages later advice on changing a tire. The latter bit of handy how-to’s are a bit weak (knowing how to assemble a pocket first-aid kit is not nearly as important as knowing how to use one), but it’s a start for someone completely in the dark on these things. The best thing about the book are the recipes and various canning projects. That’s why you should buy it. The food is quite unique. For directions on how to pickle watermelon rinds, I am not sure you’re going to have luck anywhere else.